he next big thing in Digital TV technology is OLED with their ultra thin design, brighter picture, better refresh rates, minimal parts and energy efficiency. The only problem has been size; the technology for manufacturing them is difficult to scale for large screen sizes. OLED stands for Organic Light Emitting Diode. The "O" in OLED refers to organic material. The "LED" stands for "Light Emitting Diode" and describes the process of converting electric energy into light. Unlike an LCD, it doesn't require a backlight system as a light source. The individual pixels are self-illuminating, which allows for incredibly thin (3mm) flat-panel designs that are more energy efficient. Can I buy an OLED TV today? Yes! In December 2007, Sony began selling the first OLED TV, the XEL-1. It is a small 11-inch TV and the picture quality, colors and contrast are amazing; the whole TV is just 3mm thick! A layer of organic material is sandwiched between two conductors (an anode and a cathode), which in turn are sandwiched between a glass top plate (seal) and a glass bottom plate (substrate). When electric current is applied to the two conductors, a bright, electro-luminescent light is produced directly from the organic material. How is the color created? OLED has more control over color expression because it only expresses pure colors when an electric current stimulates the relevant pixels. The OLED primary color matrix is arranged in red, green, and blue pixels, which are mounted directly to a printed circuit board. Each individual OLED element is housed in a special "micro-cavity" structure designed to greatly reduce ambient light interference that also works to improve overall color contrast. What’s next for OLED TV? Sony established a milestone with the introduction of the industry's first Organic Light Emitting Diode (OLED) television, the XEL-1. 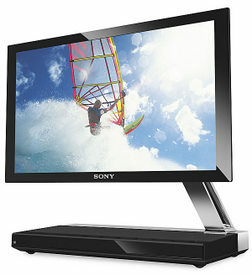 This 11" diagonal desktop color television is just the first step Sony is taking in the world of OLED televisions. Larger screen sizes and higher resolutions are possible. Panasonic announced a partnership with Sumitomo Chemical Company to develop advanced display panels using OLED technology. The partnership will turn into a joint venture to develop and manufacture screens that are 40 inches and over by 2010. LG's 15-inch OLED TV went into production this summer and should be available next year and a 30-inch should be available by 2012. Samsung plans on releasing a 23-inch model next year as well. The technology is expensive so the OLEDs won’t be able to seriously compete with LCD and Plasma TVs in the near future. Building large sized OLED displays is not easy, and it will take some time before companies are able to do it economically. New types of displays: ultra-thin, flexible and transparent displays.